Collecting and selling scrap aluminum in Southcoast Massachusetts is a great way to reduce our local landfills and make some extra money at the same time. Scrap aluminum is by far the easiest type of scrap metal in Massachusetts to find, collect and sell, because it can be found in your home, at work, in public trash cans and just lying around town in the form of soft drink, beer and beverage cans. 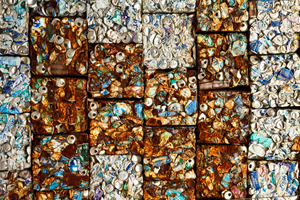 Recycling scrap aluminum as a primary focus means looking for it in other places and forms beyond beverage cans as well. Aluminum is sometimes used as the outer housing for old appliances, such as heating and cooling units. If you work with appliance upgrades, or know someone who does, offering to dispose of the old units and selling the scrap metal could be a great source of scrap aluminum and a nice side job to boot. Older mobile homes will also have wiring that is made out of aluminum, so if you work on a renovation or repair job that requires re-doing all that old wiring, you could find a good source of scrap aluminum in the walls. Just make sure you collect scrap metal legally, as there are now laws against just taking these items without permission because they are so valuable. Another great opportunity in construction or remodeling is to sell old storm window and door frames, which are usually made out of aluminum. These items get replaced, you can store them in a garage or other storage unit and then recycle them in one big trip. The glass panes of old windows can also be recycled at the local recycling center, however the aluminum is what will pay you the most. Whether you are collecting and selling aluminum in New Bedford, Fall River, Dartmouth or anywhere else in the Southcoast region, your best bet for getting the best prices for scrap aluminum is at Mid-City Scrap Iron & Salvage in Westport. Centrally located to service residents, businesses and municipalities in Southeastern Massachusetts, Mid-City Scrap Iron & Salvage offers very competitive rates for all types of scrap metal. To be sure that you are getting the best prices for scrap aluminum in New Bedford, contact Mid-City Scrap ahead of time to check on the current rates. Rates are set by the US Commodity Exchange, which forecasts the supply and demand of all materials in the United States and sets prices that are accurate to the current market. Mid-City Scrap keeps track of these rates on a daily basis and adjusts the market value payout for recycling scrap aluminum accordingly. By calling in ahead of time, you can decide to bring in your scrap aluminum right away or hang onto it until the market improves, depending on your ability to bring it in later. If you are going to recycle scrap aluminum on a regular basis or if you have a steady source of scrap aluminum that you can sell to the local scrap metal facility, you’ll want to learn all you can about how to get the best prices for scrap aluminum and what you can do to boost your take. When it comes to aluminum wire, for example, if you can remove the insulation from the old wiring before turning it into the scrap metal facility, it will be worth more money. The less that the facility has to do to separate unwanted items from your scrap metal, the more cash you’ll get in return. When it comes to scrapping old appliances, it is important to remove the aluminum housing from the rest of the appliance. Sure, most recycling centers will take the whole appliance from you, but you’ll get less money because they have to dismantle it and separate the different types of metals. Some old appliances also contain copper piping and parts as well, which should be recycled separately from the aluminum. Don’t discard copper parts, as they are even more valuable than aluminum at the recycling center. You can recycle a number of different metals in one trip, just make sure that you separate them in your truck for recycling. Check with Mid-City Scrap Iron & Salvage for tips and suggestions on how to streamline the recycling process and for help getting the best prices for scrap aluminum in New Bedford and all of Southeastern Massachusetts.